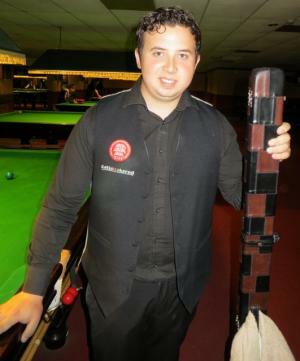 BILLY Castle (pictured) battered his way through to the southern final of the English Amateur Championship with a trademark break-building blitz. The 22-year-old Cuestars South of England Championship Tour player recorded ten runs of 50 or more, including a century, on home tables at The Crucible Sports & Social Club, Newbury. Southampton’s former Town Champion, now living in Reading, accounted for Adam King 5-0, Matt Emms 5-0 and Alan Tunney 8-3 and chalked up breaks of 113, 92, 90, 83, 72, 68, 65, 60, 51 and 50. He plays Grant Miles (Norwich) in the southern final, which – along with the northern final – takes place during the EASB Finals Weekend on May 2-3 with the two winners then playing off for the national title that was won last year by Ben Harrison, another member of the Cuestars family. Castle has also received sponsorship for World Snooker’s Q School at the Meadowside Leisure Centre in Burton-on-Trent from May 14-25, in which the four semi-finalists from each of the two tournaments receive two-year Main Tour cards.